Gurney Journey: Was Rockwell Looking? Was Rockwell taking inspiration from the illustrators and painters of Europe? Of course his "Rosie the Riveter" very consciously quotes Michelangelo. But I wonder if he was looking at other, less well-known sources. We may never know for sure about those examples. But if he was looking, more power to him! He'd be crazy not to take inspiration from the greats of his recent past. I put the microscope on my own work in the post "Borrowing"
Cool! I've never seen that Mucha piece before. My father was a recording guitarist, and his take on this was in teaching me how to "tip my hat and nod at those I admire". In jazz... well, in music, one will use a riff or lick from someone else in their piece, and other musicians in the audience hear it and recognize it, and smile. It's like saying "hey man, I so love what you did here". Well, it's like that in art too... only it's something that you have to use carefully, because there's a huge difference between admiring someones work, and ripping them off for the sake of a quick meal. So yes.. it is very common and it's wonderful when you see artists show "tribute" to other artists in this fashion. Bravo! For sure, Rockwell saw and absorbed a great deal of art during his lifetime, and as musicians do, "borrowed" consciously, unconsciously and semi-consciously. On the other hand, although I suppose it can be argued that there is an infinite number of poses that the human form can take, in reality there's a finite number of general postures and gestures. So it's impossible to say (without evidence) that just because there's a similar pose in two paintings, that the later artist borrowed from the later artist. And in a way, aside from outright copying without any attempt at improvement, change or satire - does it really matter - except to remind us that art is a sort of continuum? I know that Rockwell borrowed some ideas if not style and poses from J.C.Leyendecker, and Leyendecker frankly cannibalized his own work sometimes (using a pose or gesture multiple times in several different paintings). You can see this in many of the painting and color sketches in the book "J.C.Leyendecker" by J.S.Cutler. 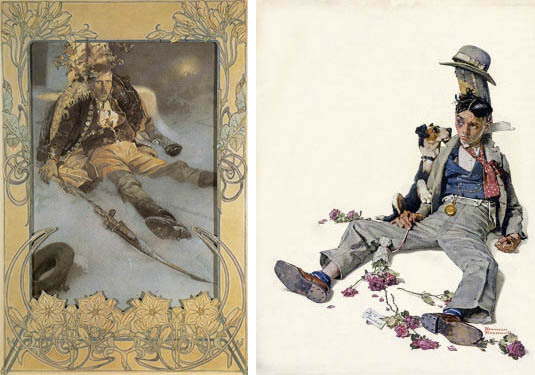 Let me add, I love Leyendecker, and I just point this out because it is interesting. I know I have done a few paintings and thought on some wow thats just a great stance or pose, and have later reused some of them (mostly reusing drawings or sketches later on in paintings). J.G. callin' out Rockwell …nice! who can deny the influence of Mucha? Awesome that he borrowed this composition. As most artists are tuned into visual language more than most, it makes sense that Rockwell would be looking at other artists and finding awe and inspiration in their works. 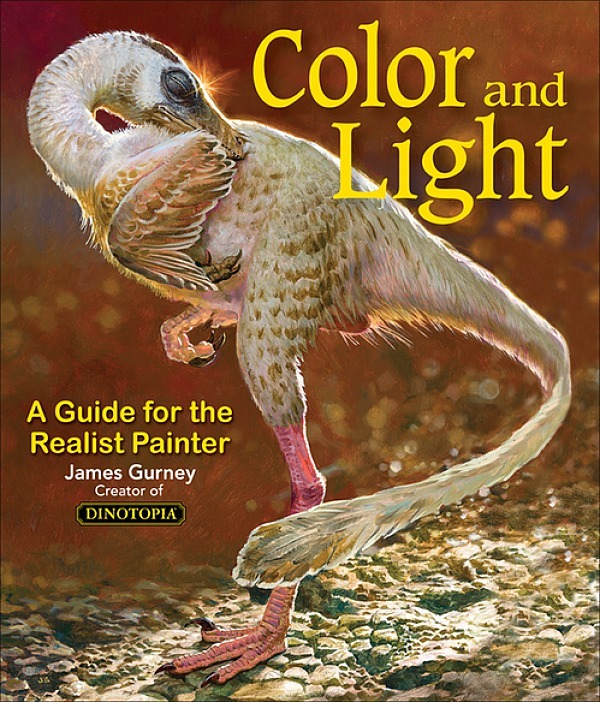 "Dinotopia" has been included in this weeks A Sunday Drive. I hope this helps to attract even more new visitors there. Cheryl and Julia, I agree most with your take on this, that it's a tip of the hat or an homage, a very positive thing that comes of being tuned in to the visual world. अर्जुन, I'm not "calling him out" if by calling him out you're suggesting I'm criticizing him for it, because in each case he got his own model and made the pose his own. Tom, I don't think these examples are coincidence. 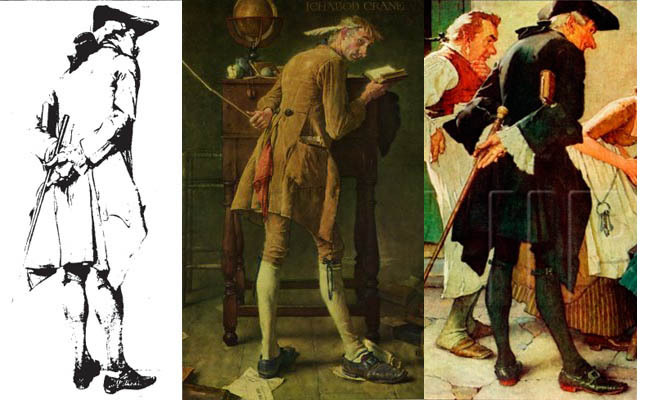 And to me it does matter, and because it's fascinating to know who someone like Rockwell is really getting inspiration from. Rockwell talked quite a bit about this--mentioning Leyendecker, Pyle, French moderns, and the old masters like Rembrandt and Michelangelo. But if he was also inspired by Mucha and Meissonier, that's really cool. He may not have mentioned them publicly because the general public wouldn't have known their names. Did he look at the 19th century academic genre painters? That would be even more interesting to know since Rockwell's orientation was to genre subjects. Entire books and exhibitions have been founded on these ideas. 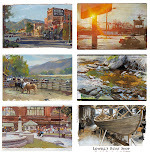 The current Pyle show is all about putting him in the context of his artistic environment. James, I wasn't very clear about me rhetorical "does it really matter?" question. It wasn't directed at the comparisons you were making, but at the presumption of some (mostly non-artists) that borrowing is dishonorable. On the contrary, borrowing is definitely a respectable and time-honored practice, and (as you put it) an act of homage. That's what I meant when I said that this practice (and examples such as you provided) remind us that art is a continuum. The figure in "Tavern Sign" is also extremely similar to the second guy from the left in Fortuny's "The Choice of a Model"
Thanks for posting this, it's super interesting!